Apple's iOS 9 finally brings features to control and improve battery life. Tired of Your iPhone Dying on You? iOS 9’s Battery Improvements Will Help. Long battery life wasn’t exactly a banner feature of iOS 8, but with Apple releasing iOS 9 for download Wednesday there’s renewed hope that your iPhone might actually last all day. The new battery usage menu in iOS 9. Uh, OK. The news gets brighter from there, though. iOS 9 uses the proximity sensors and ambient light instruments on Apple devices to determine when they’re face-down on surfaces. Using that information, the operating system knows not to turn on a device’s screen for things like notifications when it’s lying screen-down on a table. Over time this adds up to saved power. iOS 9 also offers even more detailed usage statistics than iOS 8 did, so you can figure out which apps are eating your battery life during active use or even just by running in the background. 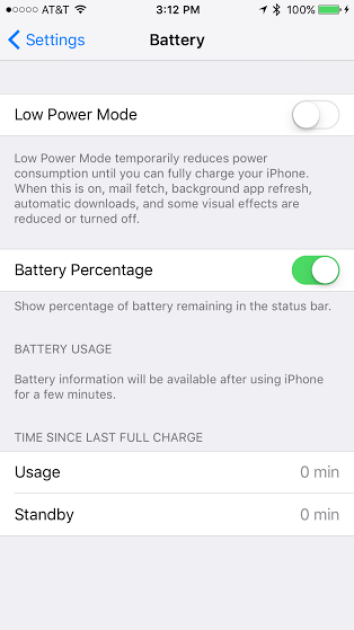 Perhaps the most significant new battery feature is what Apple is calling “Low Power” mode. When you want to squeeze out every last drop of battery life, turning this on gives you extra time—Apple claims an extra hour—but for a price. Low Power reduces the phone’s performance, dims the display, and reduces background activity. But when you get that “10 percent left” notification, you’ll probably take it. Ars Technica points out that it’s hard to measure the effectiveness of Low Power mode, since most tests are designed to push a battery as hard as it can go, but evaluations so far from multiple sources seem to show that it helps buy time. iOS 9 isn’t going to solve every battery problem—the things you probably like best about your iDevice like a fast processor and pretty screen are what use up all the juice in the first place—and Apple is certainly not the first tech company to develop these types of features. But if you have an iPhone that’s ever been dead when you needed it, it can’t hurt to run iOS 9.